Family loves this toaster. Adds to my kitchen decor and makes breakfast time much easier. The settings took a bit to get use to (probably because our old toaster was so bad) and the bagel setting is awesome. Makes a perfect bagel every time. Would recommend this toaster to anyone. The KitchenAid KMT4115CU 4-Slice Toaster has chrome buttons that glow with blue back-light illumination when in use. The extra-wide slots will accept the thickest bagels, breads, or pastries and the extra-deep, steel toasting cavity ensures even browning. The racks automatically adjust the slot width for thick or thin slices, keeping food upright for even toasting. When your food is ready, the manual high lift lever makes it easy to get it out of the toaster. Selecting the bagel toasting function reduces the power on one side of the heating elements by 50 to produce a better toasted bagel. Plus, the adjustable 5-shade setting ensures your food will pop up just the way you like it. This is a very well-made and extremely attractive toaster. Be prepared to allow at least a foot of counter space for it - it is HUGE. However, it is exactly what we wanted: its slots are definitely large enough to fit a bagel half, and I'm not talking one of those little, somewhat thin, pre-packaged bages. You can actually purchase bagels from a bakery or bagel store and they'll actually fit into this toaster without the "pre-smooshing". Very clean lines, beautiful bright red sides, shiny stainless stell and super-easy to use. Love it! LOVE! Who doesn't love a red toaster?! With two growing boys, a 4 slice toaster had become a necessity. Goes perfectly in my kitchen! We have had a great toasting experience at our house. Highly recommend! Love this thing, it looks good in my kitchen and it makes 4 waffles at a time, cant complain. really no faults to it. dings when its done in case you walk away. has a bagel setting if your into that sorta thing. I really like this toaster. It looks stylish in a retro sort of way, is easy to keep clean, and still works two years after my purchase. It browns toast easily, and is easy to adjust the temp for waffles. It has thicker slots so it can fit bagels. If I had any complaint it is that it takes too long to make the toast. I also like that it has a cancel button, making it easier to pop up toast that gets stuck. Looks great next our Kitchenaid mixer. Easily fits bagels. Cooks a little uneven. this adds some class to our KitchenAid Kitchen. It is a great looking appliance and works great. 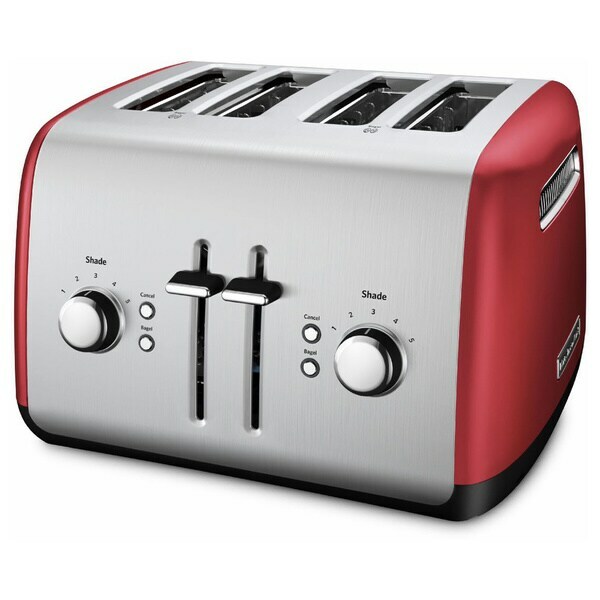 the controls allow accurate toasting on toast or bagels. slots plenty wide for the bagels. great buy for the money. thanx overstock! Quality toaster that works as advertised. Good, even browning on both sides and it can handle some thick bagels. Would recommend to anyone in need of a 4 slice toaster. KitchenAid has great products. Love this toaster - large slots for bagels. The slots are definitely wide enough for bagels :). No more getting stuck! My old toaster didn’t have “click” turns on the timer knobs and would easily have the settings changed...not always a good thing; I enjoy that this one is a click style and you intentionally move the knob. Looks beautiful in my kitchen and toasts evenly. This toaster is larger than it needs to be and has a bulbous, puffy look. I didn’t find it attractive in person. I toasted an english muffin on the setting of 4 out of 6. It took a long time to be done and the muffin came out just warmed and pale, not browned. Plus, it has an obnoxious bell that rings when the tosst is “ready”. This toaster is not only stylish but has quality going for it. Finally tired of buying inexpenxive toasters that were basically junk. I earned enough Club "O" dollars to get this at no cost from my previous purchases. This toaster is not only pretty, but huge and toasts my bread and bagels perfectly. Those people that state that it takes forever to toast bread must be some impatient people! 5 stars!!! Worth every penny! I have wanted a 4 slice kitchenaid toaster for a while, and I finally bought one! It’s perfect to quickly make breakfast for my 4 kiddos in the mornings! I love my new toaster. I like how it beeps when the toast is done and I like the cancel button. My daughter starting her collection of KitchenAid products. KitchenAid is a trusted brand. Also the reviews convinced me to try this toaster.